"Fear the Walking Dead" premieres this summer on AMC. This summer, AMC will premiere "Fear the Walking Dead," a new spin-off/companion series to its hit zombie drama. Set in Los Angeles at the start of the global epidemic, the series should shed some light on questions left unanswered by "The Walking Dead." Far from Georgia, the population of the West Coast is also fighting to survive. 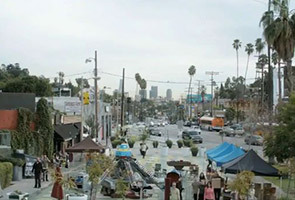 On Sunday night, along with the season finale of "The Walking Dead," AMC revealed a promo for its highly anticipated spin-off, confirming the setting in Los Angeles at the start of the epidemic. "Morning Los Angeles, hope you got your flu shot. There are reports in five states that a strange virus is going around, so if you're not feeling well, go home and take care of yourself," a radio announcer's voice is heard saying over footage of the California city. "Fear the Walking Dead" will thus depict the early days of the epidemic, when ordinary life turns to horror. This period was previously left unexplored by the original series, which introduced viewers to the zombie invasion in full swing, when the protagonist Rick Grimes emerged from a one-month coma. "Fear the Walking Dead" will examine the story through the eyes of a new set of characters. Nancy is a divorced mother and high school guidance counselor in a relationship with Sean, who is also divorced and is a teacher at the same school. She juggles her career with her family life, which is made difficult by her son Nick, a heroin addict. Her daughter Ashley, meanwhile, is applying to college. New Zealander Cliff Curtis plays Sean Cabrera, a good and upstanding man who is recently divorced from Andrea, with whom he has a son. Kim Dickens ("Gone Girl," "House of Cards") co-stars as Nancy Tomkins, joined by Frank Dillane (Nick) and Alycia Debnam Carey (Ashley). Fans of "The Walking Dead" may finally get answers to some of their outstanding questions in the spin-off's first season of six episodes. The second season has already been ordered for next year.